Resting now until the buggy lands. 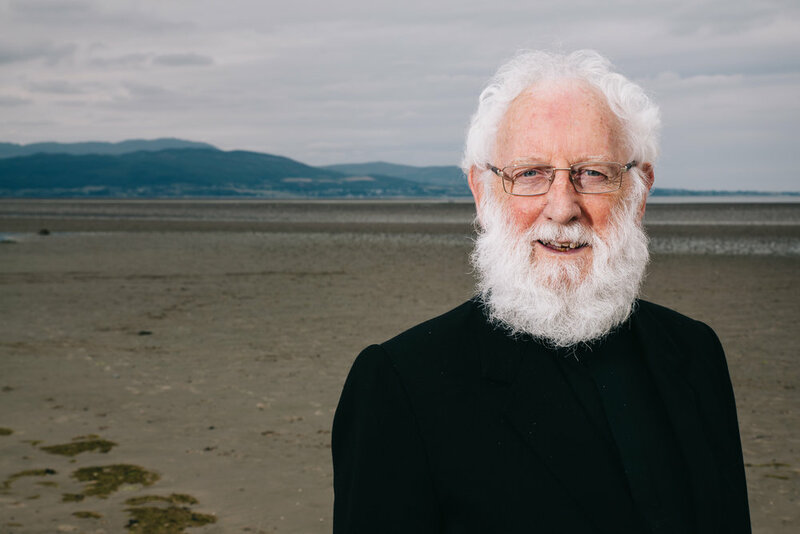 Fr.Michael Maher, born and raised in Dublin, began his spiritual journey at the early age of 19 after the death of his grandfather Thomas Ashe. Our reaction to death can often differ in many ways but for Fr.Maher, it led him to contemplate the fragility of this present life leading him to consider what it all meant. 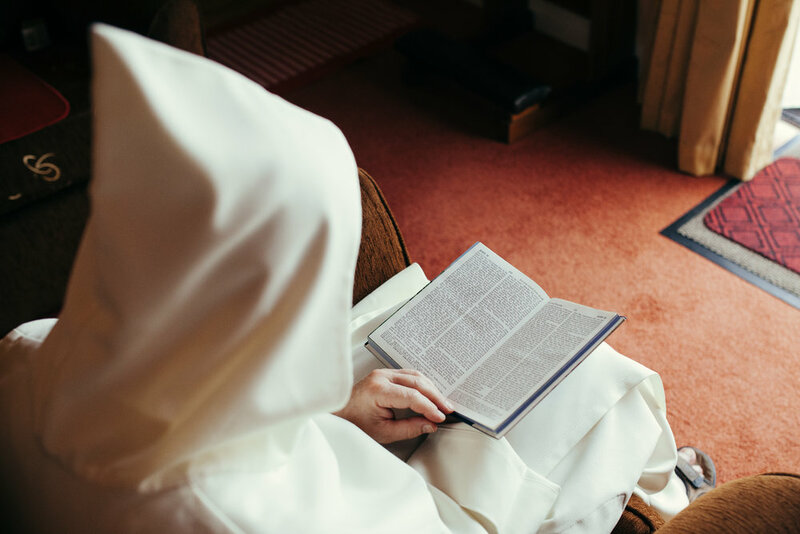 The growing love that Fr.Maher had for the Mother of God eventually blossomed into a vocation to find a priestly order dedicated to the Queen of Heaven. It wasn't such a difficult search as almost immediately Our Lady of Fatima led Fr.Maher by the hand into one of the most popular orders dedicated to her name, the ''Marist Fathers''. 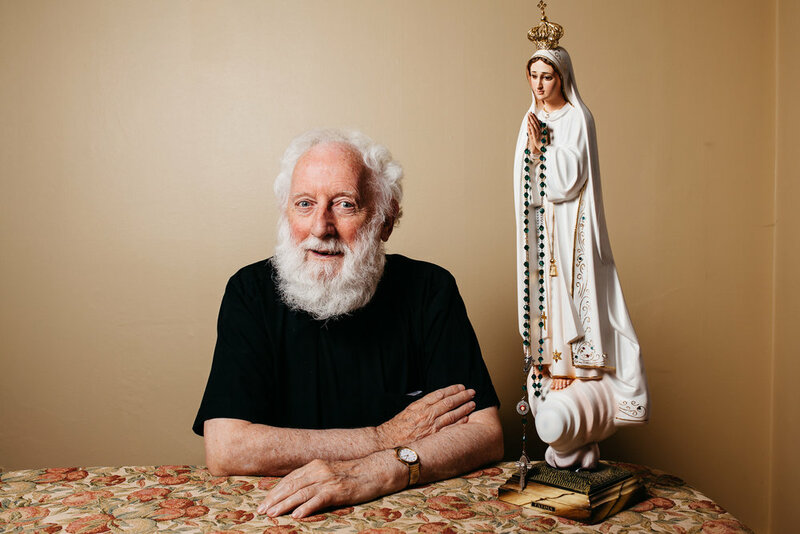 Over the years, Fr.Maher had always emphasized devotion to ''Our Lady Of Fatima'' not to mention the importance of the Holy Rosary in one's life. He is heavily insistent that we pray the rosary every day and make it an essential part of our spiritual diet to nourish the soul. 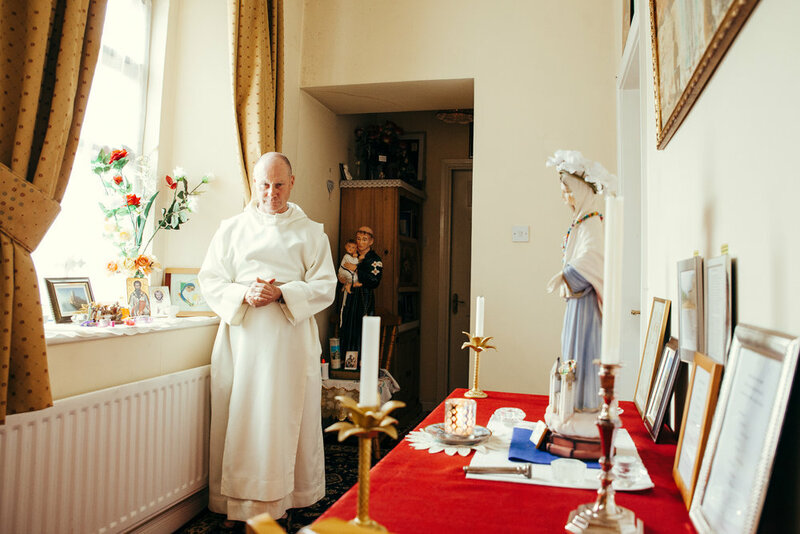 I approached Fr.Maher with an interest to show people a side of him we don't normally get to see which is his life in the confines of a parish Church in Dundalk, Co.Louth. 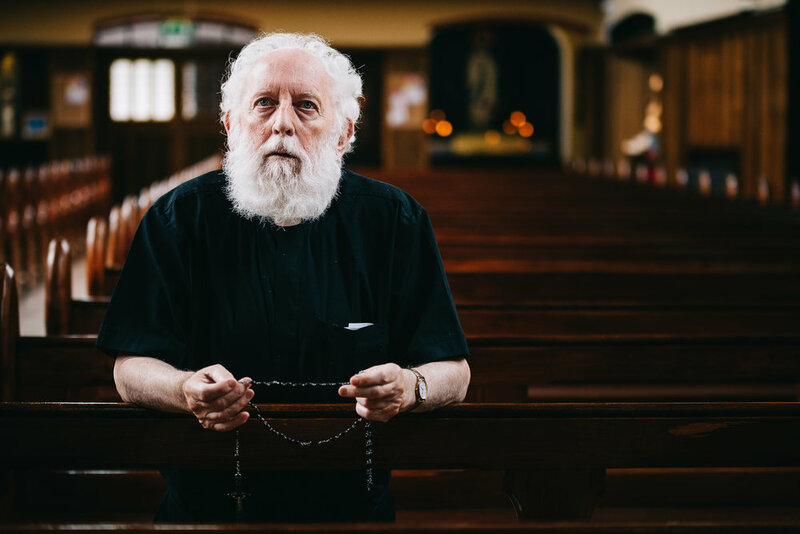 We spoke about his devotion to Fatima and he presents to us some of his favorite images, books and the history behind a pair of rosary beads he personally likes to pray on. 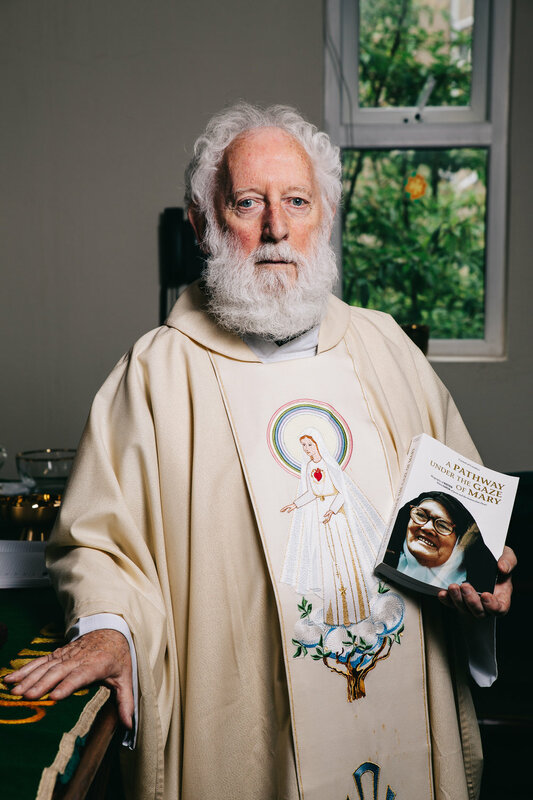 From a very young age in his teenage years Fr.Maher always had an interest in Fatima and since his ordination to the priesthood, made it his life's mission to spread devotion to Her. His knowledge and expertise in this area was so valued that he became spiritual director and narrator of the very popular movie ''The Call To Fatima'' which depicts the story of the three children and their apparitions. The movie has since been circulated around the world in 12 different languages and millions of copies distributed. I've known Fr.Maher now for quite sometime so this was a rather personal project for me. I've always enjoyed his impregnable spirit of joy, contagious to say the least and for all our theological and spiritual study, the only thing worthwhile. Fr.Maher is the type of priest that does not need to give advice at length about the spiritual life, using many words to illustrate his point. I've always felt that the mark of a good priest is one whose sheer presence prompts a transformation within you. In a sense he has accepted he's just a canvass upon which Christ paints his own self portrait to show Himself to the world. Whenever anyone asks me why God doesn't show himself to everyone, I just point them in the direction of people like Fr.Maher. I cannot stress enough this character of Fr.Maher. I've read nearly all the writings of the mystics both modern and old, from Eastern Buddhism, Hinduism, Orthodox Christianity not to mention western Catholic and Protestant mystics of Europe. From the writings of the Eastern cave dwellers and early monastics of centuries ago to the summa theologica of St.Thomas Aquinas and St.John of the Cross, there's no greater spiritual progress one can receive than to be in the presence of joy Himself as manifested through people like Fr.Maher. 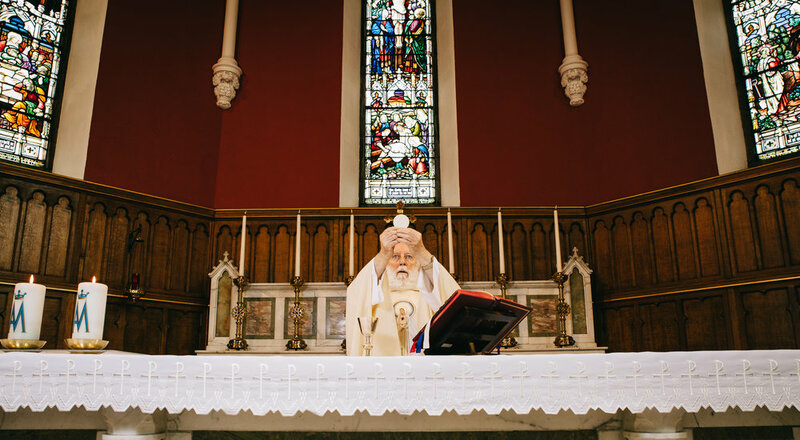 It is now my joy to present to you one of the most ordinary and through those he ministers to most extraordinary priests residing in a simple parish Church in Ireland. Now I can bring to you a little piece of the joy I experienced with him through the art of photography. 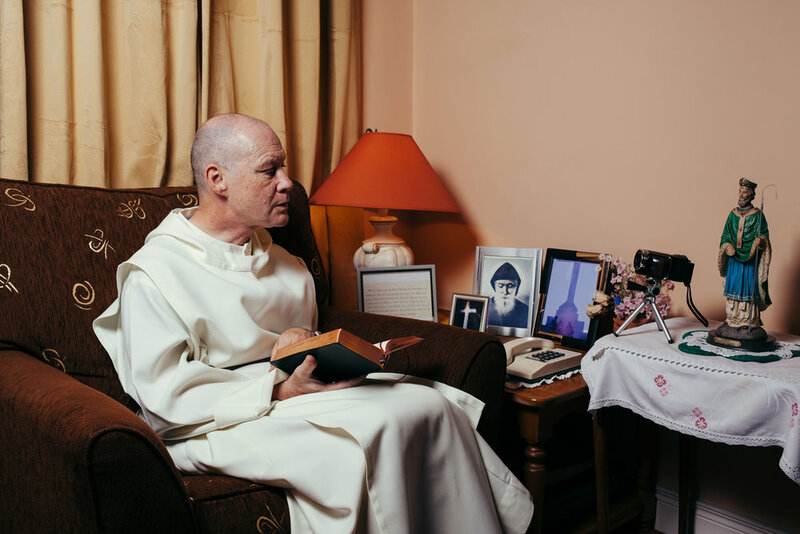 As we spoke about the importance of the rosary and the days that lie ahead of us, Fr.Maher takes his usual seat by the window contemplating a world that's forgotten it's Christian roots. Fr.Maher introduces us to his work on Our Lady Of Fatima and here he sits beside a well hand crafted statue from Portugal. 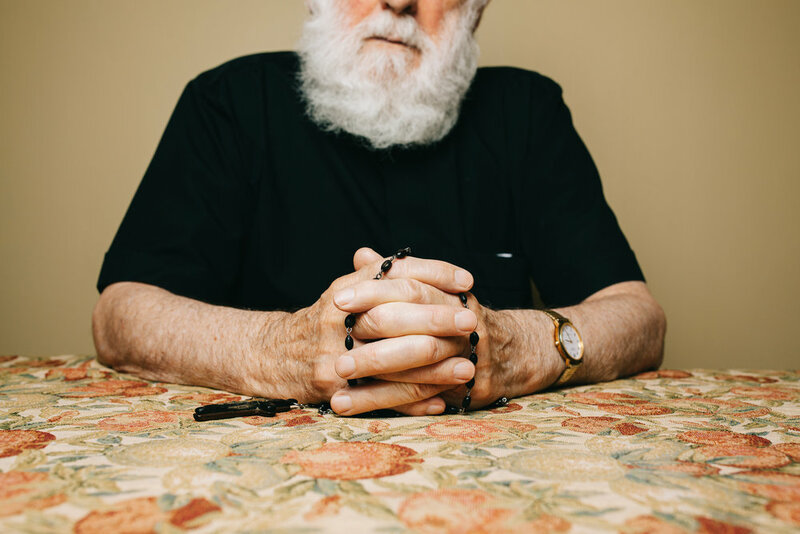 As we chatted about matters concerning the purification of souls and the importance rosary beads can have in one's life, I took a picture of a rosary he holds dear to his heart. 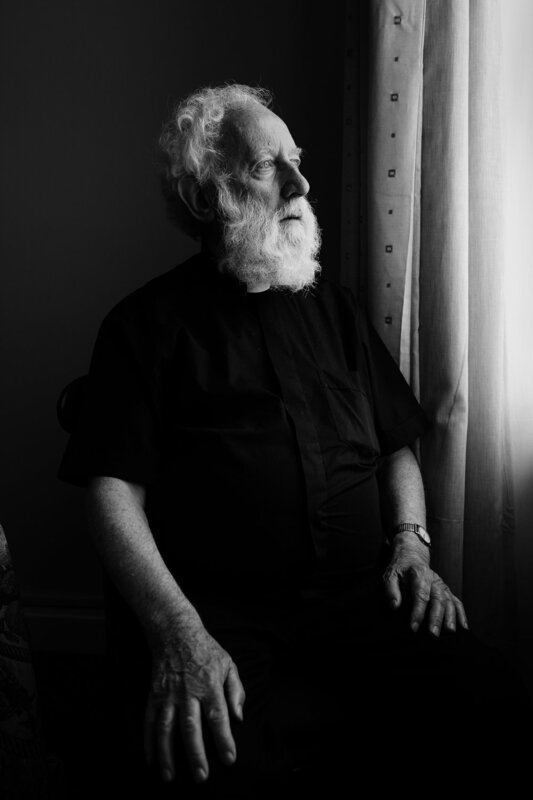 In 1937 His Mother was having a difficult birth at the time and the parish priest gave her his rosary beads. The baby boy was born and she called him ''Michael Maher''. It is thanks to the Prayers said upon this rosary that Fr.Maher came into the world and when his Mother fell asleep in the Lord, she left them for him. They were prayed on so much that the wood on the Cross began to wear away over the years. In a bid to rescue it he took it to a carpenter in Dublin who fixed a new piece of wood to the back of the Cross in order to keep it all intact. Fr.Maher wanted to fetch me some of his favorite memorabilia of Fatima that include his long time favorite books and pictures. As I waited for him to find these I saw a copy of the famous Caravaggio painting hanging on his wall. I saw the real thing in the National Gallery of Ireland a number of years ago and as I've been visiting Fr.Maher for quite some time it always catches my eye. 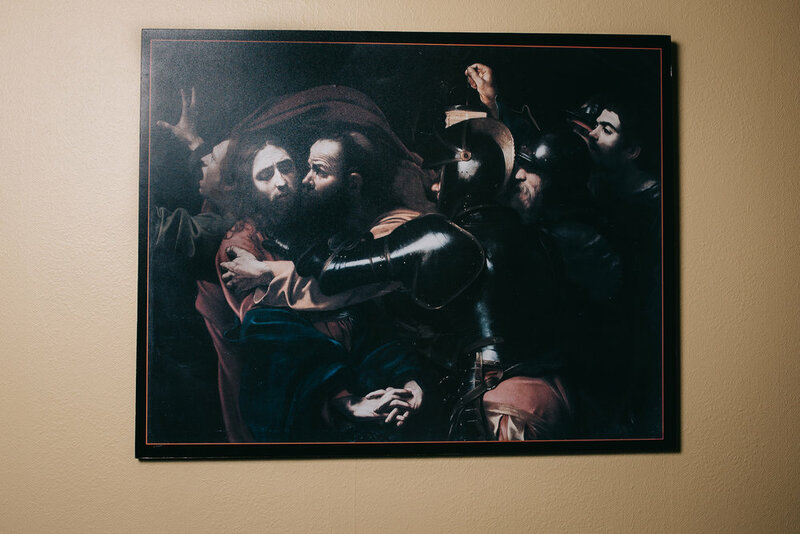 I often wondered why it was Fr.Maher liked it and that perhaps it serves as a reminder to him and every Christian and religious person in the world of our own weakness in the face of sin. That unless we remain vigilant we too may succumb to a betrayal, corruption being always around the corner. Indeed when I see this picture I'm reminded that the kiss of Judas is one that has echoed for centuries until the end of time. 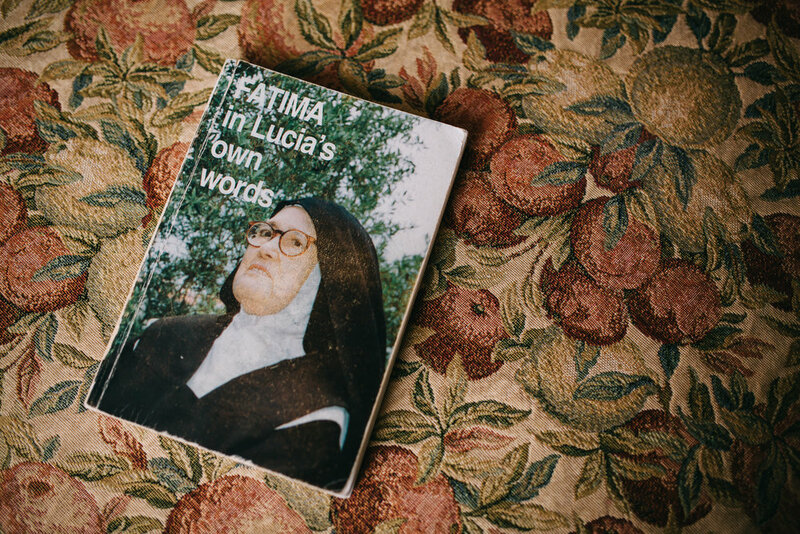 Published in 1976 '' Fatima in Lucia's Own Words'' is a collection of memoirs and letters written by Sister Lúcia of Fátima, the last surviving seer of Virgin Mary apparitions in Cova da Iria, Fátima, Portugal. She fell asleep in the Lord on February 13th, 2005. The 13th date is significant to Catholics here as it was on the 13th of May the first apparition took place. Opening the book I serendipitously happened to fall upon one of the many religious bookmarks placed within it. Was it Our Lady Fatima herself reaching out to us all? On our way to Mass we stopped at the oratory where Father Maher showed us an Icon and relic of St.Peter Chanel. Born in France, St.Chanel became a Marist Father who was martyred on the island of Futuna in the Pacific. You've heard of the perfume Chanel but this saints relic gave a more potent and fragrant odor that's difficult to beat, namely because of its origins in Grace. I take a closer look at the relic which is a piece of bone from the Saint. Before Mass is celebrated, Fr.Maher hears the confessions of his parishioners. This is the first time I’ve seen the inside of a confessional. After hearing all those confessions, Fr.Maher prays a rosary for his parishioners before Mass. Fr.Maher prepares for Mass. I notice a book near his left hand and pose a question as to what it might be. Robed with vestments of Our Lady Of Fatima that he got 10 years ago in Portugal, Fr.Maher turns and shows me the book, a biography of Lucia. It's the latest most popular book doing the rounds and so it stays with him at all times. Fr.Maher preaches an interesting homily. The focus of his homilies are always a certain type of prayer. Can you take a guess at what prayer that might be? Raising the Body of Christ, Fr.Maher sees nothing else. Neither death nor life stand in the way of this awesome moment. Fr.Maher raises the Chalice along with a solemnity of heart, soul and mind that is always directed towards Christ. Fr.Maher sits in his chair to reflect on the most incredible moment the earth will ever experience where God descends to us in the mystery of the Mass. His eyes were closed and he surprised me by opening them so I captured that moment. 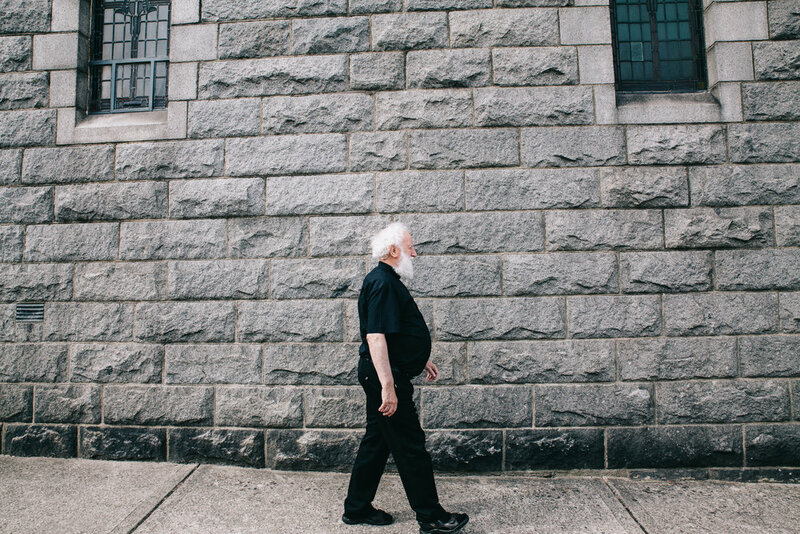 After Mass Fr.Maher takes the long way home and walks from the Church back to his cell but he's not finished yet and is about to embark on another adventure. We drove from the Parochial house 5 minutes to the seaside village of Blackrock. You can only imagine the laughter and humor that ensued when we happened to come across ''The Priests' Beach''. It was all meant to be and I am probably the only one who can say I walked that beach with an actual priest by my side. Walking down to the beach I hear Fr.Maher calling me to turn around. He has spotted something that I missed. With great humor and joy he exclaimed ''Hey Stephen! look...save...our..souls. Indeed Fr.Maher is the life saver thrown by Christ into the turbulent and troubled waters of the world, to save us from drowning in our sorrows and sins. Walking along the beach it was hard for us not to discuss and ponder the stories where Jesus himself preached from the shores of Galilee. The wonderful thing about the parables is that they are timeless and you can't really put a date to them. No matter where you go the earth always reminds you of a parable. It was here that I took my final photo to finish our day together. As he stood on ''The Priests' Beach'' pondering eternity, a sudden Divine sorrow mingled with joy came over me that today of all days was (as Fr.Maher always puts it) ''A Divine Appointment''. Walking past this young man I saw the entire Universe summed up in one photo. The way the light is upon the young man as he sits eating his lunch being framed by the backdrop of the constellations of stars is amazing. The rhythm of him with the pigeon and the beer can seemed to tell the story of the entire universe coming together. I shot it at f/8 as is usual with street photography to get maximum depth of field and at 1/1000’s of a second for fear the pigeon may fly and I wanted to be able to freeze him if needs be. I’ve always found that being prepared for another possible composition arriving ahead of time is better. It’s important to anticipate our subjects next move so as never to miss a shot should it arise. ‘‘Say cheese’’ says Auntie Ann when she points the camera in your direction. If you refuse to smile then oh boy you’re in trouble and frustration ensues from the whole family because you’re not doing what’s expected of everyone who stands in front of a camera. Why then, are people like this when it comes to taking photos? Well I’m no great expert on the history but somewhere before the mid-20th century nobody ever smiled for the camera. Take a look at some photos of the Russian Tsar and how solemn he and his kids appearance is.Take a look at almost any photograph from that era and you will see even little children looking so solemn. In fact lets go back even further before the invention of photography and the painting of Christian and Buddhist icons which always depict Jesus Christ or Buddha as not smiling. Isn’t it a bit ironic then that Jesus and Buddha who are associated with peace and happiness are almost never smiling in pictures? Most medieval portraiture has almost no smiling faces at all, isn’t that incredible? Photography wasn’t affordable over 100 years ago and so only the really wealthy and those of royal blood could afford it. It was not until the arrival of the affordable domestic use of the camera many years later did people begin to smile because everyone wanted ‘‘happy’’ memories for their holidays and family gatherings so the expectation to express happiness suddenly became the new culture. Well . . . now you know a little bit more about why you expect me to smile. You've decided you want to venture outside (or into the woods) and capture a waterfall. As intimidating as it may seem, it's not altogether that problematic as long as you abide by a few rules. The first rule you need to adhere to is the time of day. I find the perfect time of day is when the sun is not splitting the trees. On the contrary a dull overcast day is precisely the perfect soft lighting you need. When the sun is splitting the trees you get harsh light and hot spots in your photo and it can really destroy your image. There are exceptions to the rule when photographing in the woods sun splitting images but for waterfalls it's generally not a good idea to go out on a sunny day. Get yourself a pair of wellies or waterproof boots. Depending upon the depth of the water I generally use one's that go no higher than the knee so nothing too major. You will need a 10 stop ND filter and also a polarizing filter. The 10 stop filter will force your shutter to stay open longer like the referenced photo above shot at 40 second exposure. The polarizing filter is a good piece of equipment as it will eliminate any existing reflections that are on the rocks including the glare in the water. Generally speaking with a polarizing filter you must be at a 56 degree angle to your subject for it to work most efficiently. Looking at my photo you can see I got rid of some of the reflection on the rocks but it didn't quite get rid of all of it. Not such a big deal really but if you can cut some of it out why not? Furthermore the polarizing filter adds an extra stop of light giving you additional time where the shutter will be open. Last but not least is the need for a very good tripod and to be honest I'm using one I bought here for €80.00 or so. It was a manfrotto so you can get away with a more affordable tripod depending upon the weather conditions and the rapid movement of the water. In the woods where I am I've literally got no wind to contend with at all and I'm shielded from it by the large rocks and surrounding trees behind me. I don't get too encumbered by camera settings when it comes to long exposure so I'll just choose the smallest aperture available to me on the lens in this case it being f/22. You may want to shoot at 8, 11 or 16 but it all depends upon what kind of exposure you're looking for and the desired finished image you wish to achieve. I had a large foreground here so I splashed out at f/22 to get as much depth of field as possible and nice silky smooth water. Composition is dependent upon the type of waterfall, stream or nice rapid river that you're currently exploring. I generally try to shoot wide with something in the foreground. I've seen some amazing waterfalls from Iceland where the person photographs themselves or a friend in the foreground in order to give the viewer a sense of the sheer awesomeness and epic size of the waterfall that they're looking at. We only ever get out of photography what we put into it. Sometimes you may see a nice composition but it's covered in debris from the storm the night before. If it's possible then removing this may be your only option to getting the photo but I don't recommend any unsafe practices. If it's a park where many people congregate sadly litter bugs are plentiful among us and so be sure to examine the area for any plastic wrappers or rubbish hiding among the rocks. Sometimes you may be required to get into the water and walk upstream until you find a nice composition. Your enthusiasm in such a strenuous hike into the woods will also determine just how good of a picture you come home with. I'm sure you may still have some questions so please feel free to ask me anything in the comment section provided below. Best of luck!!! Fr.David was born in Wales and raised in the Baptist Church. 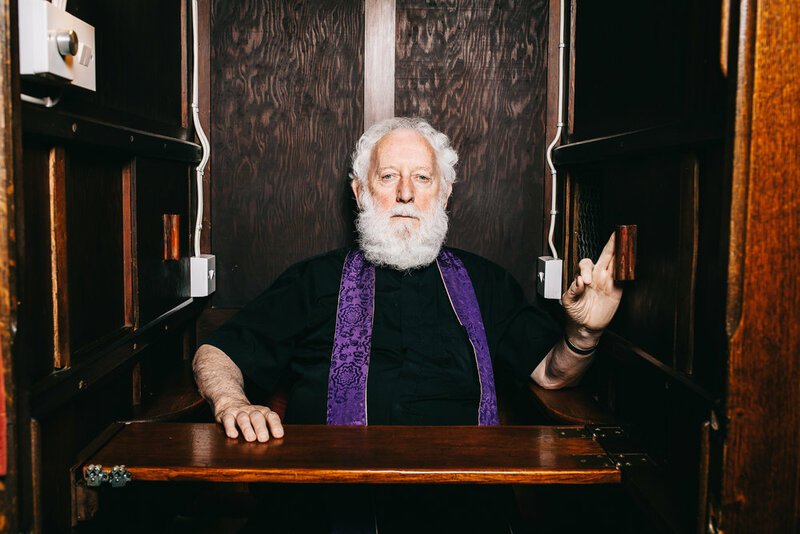 In his mid teens he spent most of his life trying to convert Catholics until he happened to stumble into his local Catholic Church one day in the late 60's. He was immediately blown away by the Latin chants, the billowing incense and the sense of the mystical that encompassed the entire liturgy. 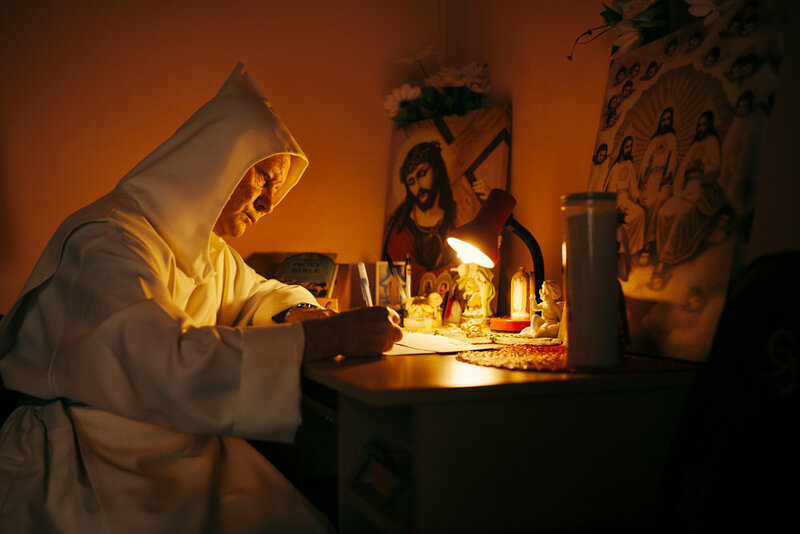 Shortly after his conversion, although he was too young to enter the monastic life, they bent the rules in his favor. 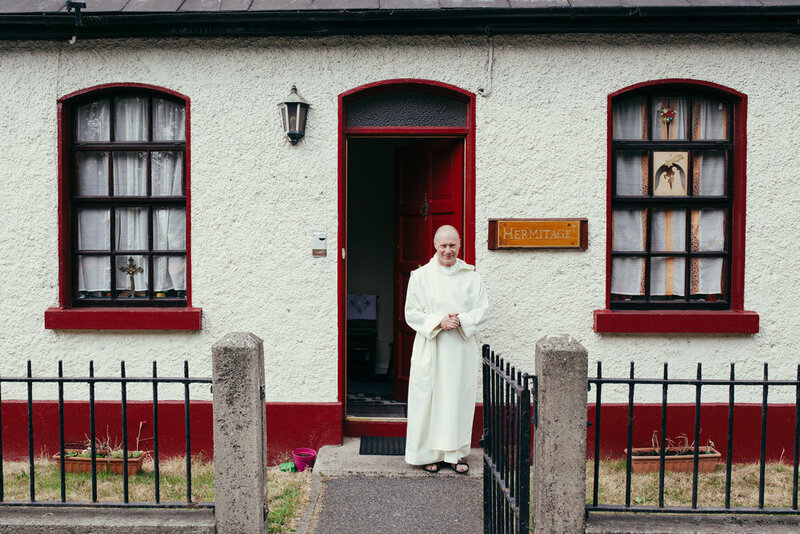 With his parents blessing he went to be a Monk in France where he spent most of his life before moving around the monasteries of Europe, ending up in Italy and finally arriving in the village of Duleek, Ireland, where he now resides indefinitely. Fr.David has given me the very rare invitation to document his daily life. 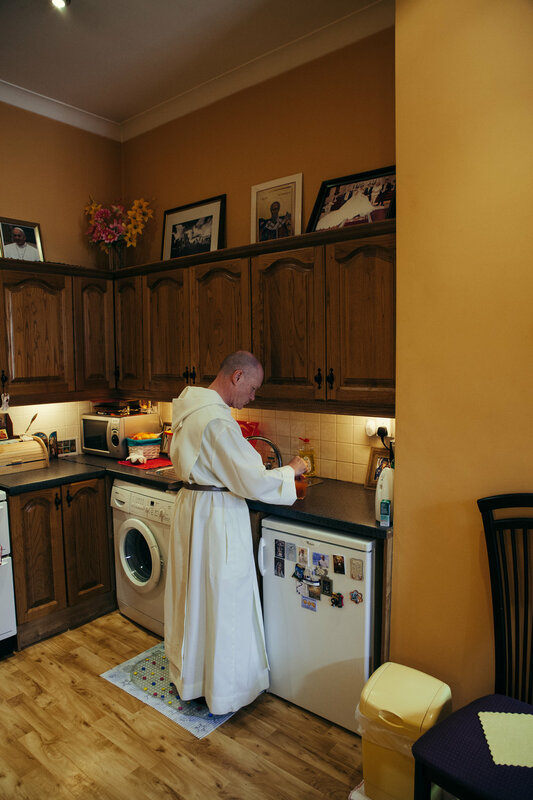 Hermits don't normally allow this given the nature of their vocation to be in total silence. I am therefore grateful he allowed me in. Fr.David Jones reads me some of his favorite Bible stories. I asked him to show me his favorite place to read. He said ''this chair would be where I sit and read my favorite book of all ''The Bible''. I sat him in the chair and he read his book which he did so but silently at first. I captured this silence and asked him to read aloud if he wishes to do so. Fr.David reads aloud the story of Lazarus raised from the dead found in the Gospel of John chapter 11. 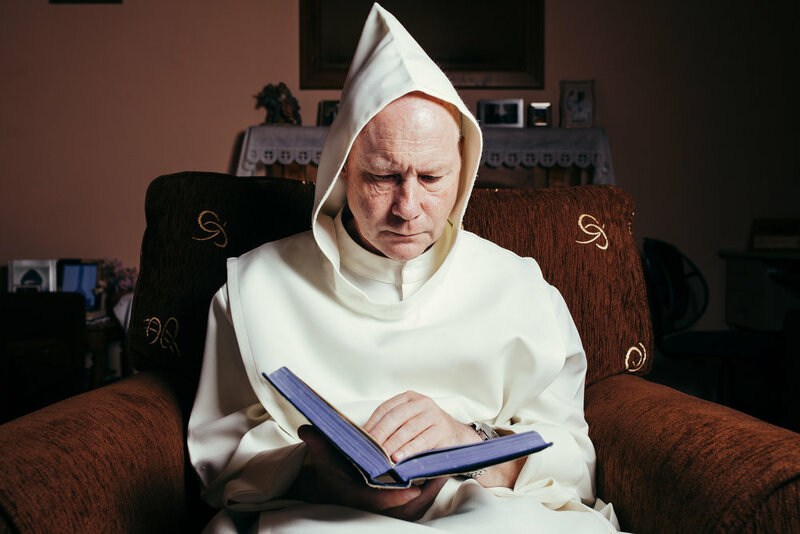 Fr.David writes a letter to a dear friend pondering his next line. Icons of Jesus inspire Fr.David Jones in his writing. After Fr.David finished writing his important letters, it was time for the Divine office. I was mesmerized by the humility of kneeling on the uncomfortable floor for 20 minutes. Fr.David has two altars of which pictured here contains a relic of the true Cross of Christ. All that prayer and worship does make one thirsty. After satisfying the thirst of Christ for Love, Fr.David now tends to his own thirst. Fr.David Jones leads us through vespers. The soft kneeler's are available to him, but he prefers to kneel on the hard floor. 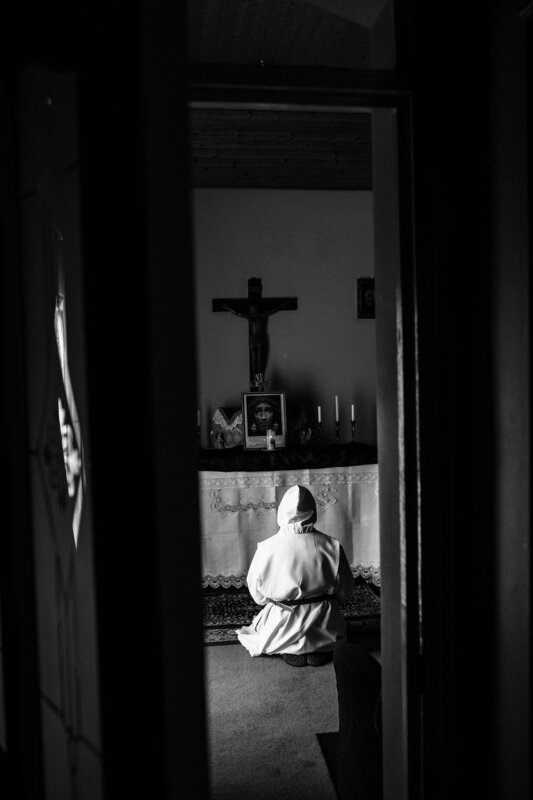 In the ascetic life discomfort is not just there to keep Monks humble but helps with their concentration on prayer. 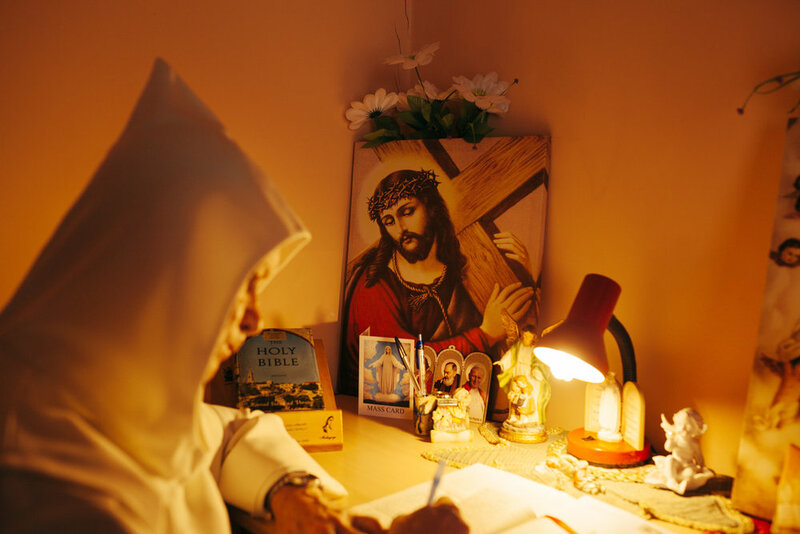 A light illuminates his Divine office prayer book, enabling him to see in the dimly lit chapel where the true light comes to illuminate the darkness of our souls. 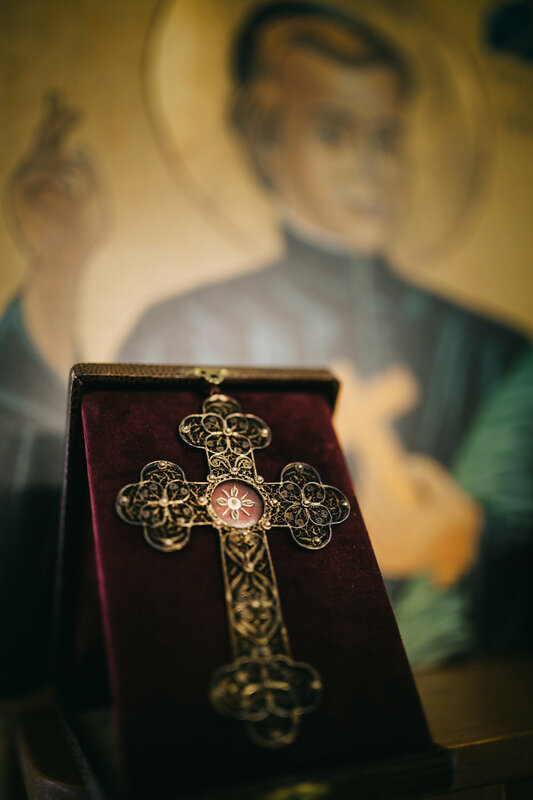 A closer look at the Crucifix that hangs above Fr.Davids Tabernacle, forever reminding him he must be crucified to the world on a daily basis for the rest of his days. An altar dedicated to the Blessed Virgin Mary greets us prior to entering the chapel. Whilst Fr.David finished his prayers I came out here to take a closer look. Fr.David came out after prayer and calmly waited for me to finish so I took a photograph of him whilst doing so. As father David spoke with me he looked out the window and I take a photograph of him in the midst of this. I asked Father David to show me his sleeping quarters. Upon entering I asked him to show me the first thing he does when he awakens. In the midst of reading an excerpt from his book, I noticed a contrast between the light and darkness that encompassed Fr.David, as if to illustrate that fight between light and darkness within us all. 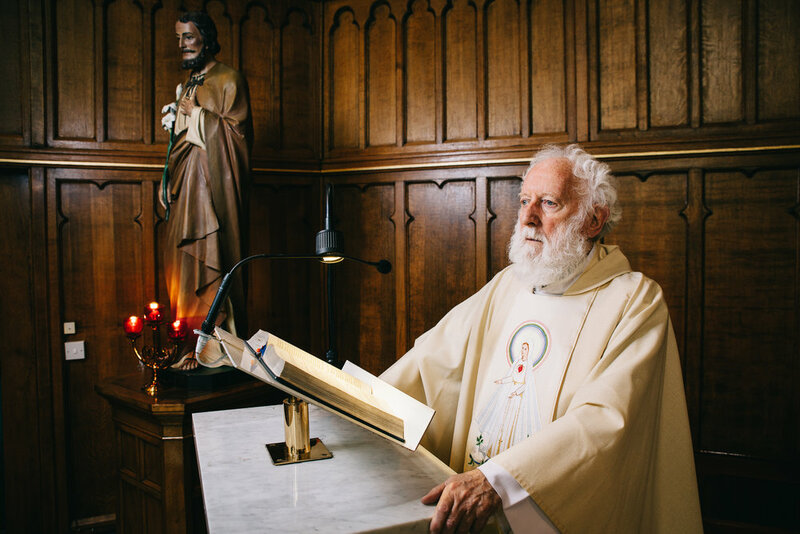 Fr.David takes me back to his main Chapel where he reads one last story. I invite him to look at the camera where he surprises me with a gentle smile, providing me with a rare glimpse of the radiant joy of Christ within him. From my own perspective, I see a face that has been through so many battles in life. From his initial conversion and struggle with the world inside, to the 10 year vow of silence and fight to quiet his old self, It's impossible not to be inspired. Fr.Jones obviously found the treasure most of us seek. And instead of hiding it, points us all in the direction where we too can avail of such Graces. In Recent months I took my son to see ''The Last Jedi'' Star Wars movie in which Jedi Master Luke Skywalker in a troubled galaxy, becomes the last Jedi in the rebellion against evil. Maybe I'm wrong and there are more of them out there. If there is, I must find them. The Irish people need to know that Christianity is not yet dead and that a ''new rebellion'' will rise from the ashes once again. When It came time for me to leave, it wasn't easy as Fr.David made quite the impression upon me. People like Fr.David sometimes without saying anything at all, by their very life, remove us from the comfort zone we've developed for ourselves. I would liked to have stayed much longer with Father David, but I realized that I have a wife and two children at home I must attend to.In my house (or domestic Church) we wage the same war just on a different part of the same battlefield. I came to understand that this is a war in which our weapons may differ, the end goal being always the same. . . getting to heaven. It is very easy for us to see Father David as looking to become an escapist seeking only to run away from the world. Countering this thought, we must admit that all of us are escapists who run from silence forever entertaining our our idle thoughts. We all run away from God to cower into the corner of comforting leisure's which serve only to exclude him. Leisure's such as alcohol, drugs, the cinema, video games, facebook and social media, all of which we use as a means to run away from the real fight in front of us.The more I got to know Fr.David, I began to see him not as an escapist, but a brave man who has decided to confront the world within himself that most of us are unwilling to confront. Like the monks of the past, he goes into the desert to confront the Devil for the sake of all our souls. He inspires us to take up the same fight in whatever position we find ourselves in, be it the religious life or one in which we struggle with an upside down world opposed to all that is Holy. 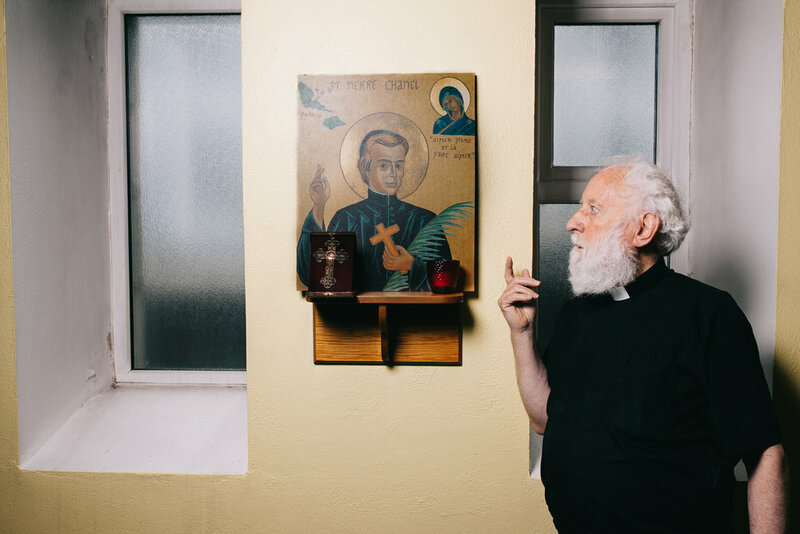 I hope you've enjoyed this documentary of Fr.David and I'm eager to see him again as he's left the door open for future visits. It's up to the photographer to examine his environment and to keep a keen eye on the behaviour of his subjects and the environment that accompanies them. The reason for this is it will help enhance your portraiture to the extent that you're less likely to miss something and as a result produce something lifeless. The manner in which you utilize your lens of choice in addition to the surrounding environment and knowing how/when to use it can really make or break your photograph. Wide angle lenses aren't always a portrait photographers first choice because they tend to distort the person features, giving a sort of fish eye appearance. The wide angle therefore can be unflattering and so a telephoto lens is usually the popular choice here for a good portrait. Taking note of this we can surmise from the photograph of my son at the piano, that wide angle portraits are not always doomed to fail and can even be great if you do it right. I was attempting to take a happy picture of him playing the Piano but sadly my son was not in the mood. Children are very honest and sometimes no matter how much you attempt to develop an atmosphere of happiness, such is their honesty that they'll just end up being who they are at that moment. He's rather melancholic in this photograph. I saw the Piano and placed it in the foreground going from the high key's association with cheerfulness to the very low solemn keys of melancholy where my son happened to be. I don't know about you but when I look at this image I hear the sad music. There is a rhythm from start to finish that you wouldn't have got with a portrait lens such as an 85mm. The Piano key next to my son that is missing its original ivory casing seems to suggest that something is ''missing'' which is to say the absence of a cheerful mood. Furthermore the folding of the arms convey a sense of closing off from the world, a special guard that doesn't want the world to get in, nor does it want to give anything away. The entire image is rather melancholic, there's no escaping that but here's the defining moment between a photographer wanting to be in charge of the mood but the subject being in control of how the photograph will turn out. The lesson to be learned here is that sometimes we need to allow the subject to take control and be themselves. By doing this we then can often end up with a photograph that makes a real impact in a sense by just allowing nature take its course. The next time you pick up your camera I encourage you to examine your environment but also look for the opportunity to tell a good story and use that environment to do so. We have all been there when we first get a camera. It's OK, literally every photographer when they first started took really bad photographs and made all those mistakes. Bouncing with excitement we come onto a lovely beach, walk up, take a photograph and walk away again. That's what tourists do but you're not a tourist you're a landscape photographer so it's time to calm down and think before you press that shutter and get organized. Show up an hour before Sunrise/Sunset. Examine your environment for prospective compositions. Always ensure you've a solid foreground, middle and background. These are the ingredients for something you can hang on your wall. We just spoke about foregrounds but it's necessary to elaborate on the reason why they're important. The wider your lens, the stronger your foreground needs to be because this is what gives your photograph that all important sense of depth and rhythm. If for instance I took this photograph without the pier in the foreground it would look OK but would be too flat and lose it's initial sense of impact it possessed with the pier. Therefore always look for leading lines whether it be rocks that create this or a man made structure like a fence or a pier. In art we use what is known as the color wheel where we can see the different colors that compliment one another. Sometimes our eyes are naturally drawn to such a scene but I want you to examine the color wheel anyway. Take for instance the colors orange and blue in this photograph. Not only is the boat the strongest color against the blue of the sky but even that subtle tan or orange color found amidst the sand and seashells further creates that rhythm of color. With all the tips I've given you can see that I don't want you focusing on what camera you're using or lens. I want you to focus on composition, content and color. If you approach your scenes like this in future you will do great.